Already at the start, the "run" on the CMT Stuttgart is clearly noticeable, long traffic jams, which extend far to the A8 and that despite the lack of rush hour traffic on early Saturday morning. 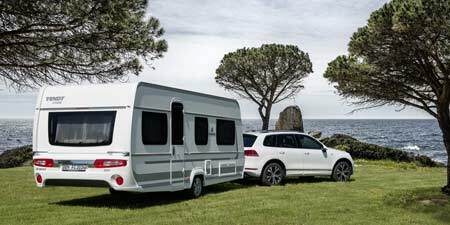 Once again, the CMT Stuttgart offers not only colorful holiday ideas, the associated vehicles and the large number of tents with the most beautiful destinations and campsites from all over the world to all leisure enthusiasts. And while some outdoor exhibitors had to first get used to the temperatures due to the weather, and in some cases even had to shovel surfaces off the snow, many visitors, at least imaginatively dreamy, were already making their way along their dream destinations. Special travel topics such as cycling and bike-travel culture will be presented on the first weekend in the company's own exhibition hall 10. At the CMT Stuttgart you will find inspirations, impressions and most important information for your cycling holiday. We came here and found the new travel profile BT Voyage, a concept of rental stations for the wheeled trailer with integrated tent, called BTurtle, which can be borrowed along the already established cycle routes as overnight accommodation during the trip. The first rental stations in Austria, Switzerland, Germany, France and Spain have already been set up. An interesting offer from an exhibitor from Nuremberg, the fashionable hat design for cyclists with integrated helmet. A great idea, away from the dreary uniform gray of the helmets, which in addition to the pure protective function also look interesting. An employee explained us the further advantage, which beside the sun and rain protection by the broad brim against too strong sun glare and also prevents from the rain water which cannot directly get from the rear helmet edge to the back of the cyclist anymore. In 2018, the organizers welcomed around 2,192 exhibitors from 100 countries and 265,000 visitors to the CMT in Stuttgart on a total of 9 days of the fair. We'll see if the fifty-first CMT breaks this record from Saturday, 12/01/2019 to Sunday, 20/01/2019. CMT Fair Stuttgart exposing outside - exhibition difference!